Concept: These are wet forest ecosystems with water at or near the surface for most of the year. They are generally dominated by hardwood species such as red maple and white ash, but also include mixedwood forests with balsam fir. The shrub layer is mainly regenerating tree species, while the well-developed herb layer includes many species of ferns and sedges. Moss abundance is low to moderate. 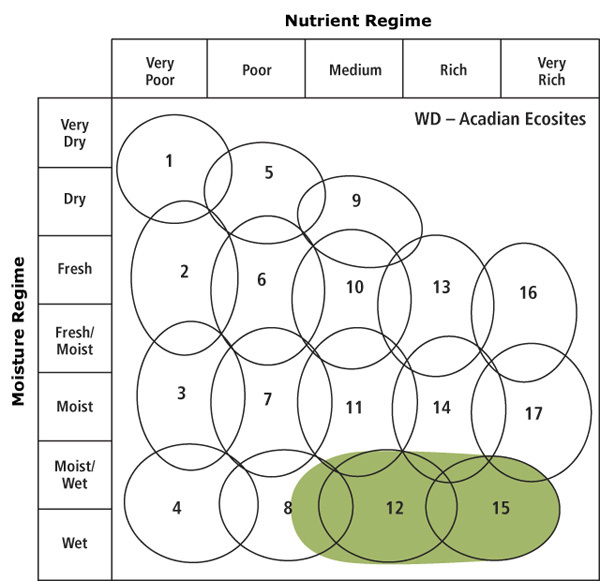 Vegetation Types (VT) are associated with moderate to high nutrient availability with increasing richness indicated by white ash presence. They occur primarily on level to depressional topography with soils derived from either mineral or organic parent material. All VTs in this group are found in the Acadian Ecosite group, with some red maple and balsam fir dominated VTs also found in the Maritime Boreal Ecosite group. Environmental Setting:Vegetation types in this group are found on upper and lower flats, lower and toe positions of gentle slopes, shallow depressions and riparian zones. Most sites have little (if any) surface stoniness or exposed bedrock. Soils are generally derived from glacial till, fluvial, lacustrine and/or organic deposits, with fertility enhanced by ground water or seepage inputs. Rooting depth is strongly limited by high water levels. Various VTs form small to large patches on the landscape. This group is found throughout the province, but is prominent in the Northumberland Bras d’Or Lowlands (500), Valley and Central Lowlands (600) and Western (700) ecoregions. Successional Dynamics:These wet hardwood and mixedwood forests are mainly edaphic climax associations maintained by excessive moisture. 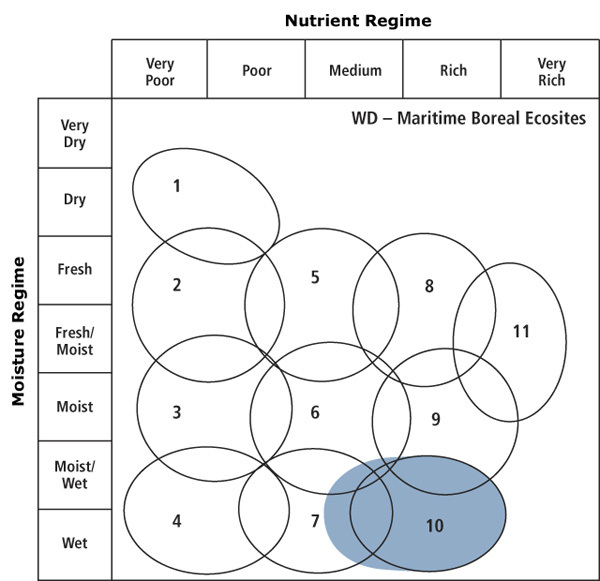 Fluctuating water levels, windthrow, insects and disease are significant disturbance agents. Stands within a given VT may display a range of development stages depending on disturbance history and natural senescence. Ecological Features: Most ecosystems from this group occur on wet soils but some are infrequently found on moist upland sites. Wet deciduous forests are relatively common small patch ecosystems, making unique contributions to landscape structure, hydrologic regime and habitat diversity. Stands often feature small pools of standing water, irregular surface topography and slow moving streams. Organic accumulation in wet deciduous forests is usually lower than in wet coniferous forests, while water flow and nutrient availability is generally higher. Especially wet stands may persist as woodlands, with stunted trees and marsh and/or fen understory species. Wet deciduous forests may provide habitat for invertebrates, lichens, amphibians (e.g. wood frogs, yellow and blue spotted salamander), reptiles (e.g. wood turtles, ribbon snakes), mammals (e.g. moose, water shrew), plants and birds (swamp sparrow, common yellow throat, woodcock, wood thrush, Canada warbler and northern waterthrush). Edaphic climax forests in this group are self sustaining, and many express long term ecological continuity. However, stand dynamics and old growth development are not well understood.